Pickpockets started targeting mobile phones pretty much as soon as the devices appeared. The newfangled devices didn’t come cheap, so reselling them was fairly lucrative. Sadly, thieves continue to thrive in today’s smartphone-dominated world. Most smart devices aren’t inexpensive either, and what they contain is often worth even more. Everything could’ve been completely different, but people were too lazy to put passwords on their smartphones. A smartphone that can’t be unlocked can’t be resold, which makes it worthless. At least some Android smartphones cannot be reset to factory default unless the PIN is entered, so stealing them to make a quick buck doesn’t really work. And more important, without the PIN, the device’s contents can’t be pinched, either. After all, modern smartphones are portable treasure troves of data for everything from banking and payment system apps to social media and e-mail accounts, with horrible consequences if lost. However, only 48% of people we surveyed bother to protect their mobile devices with a PIN or password. That goes a long way to explaining why pickpockets are still doing a roaring trade. 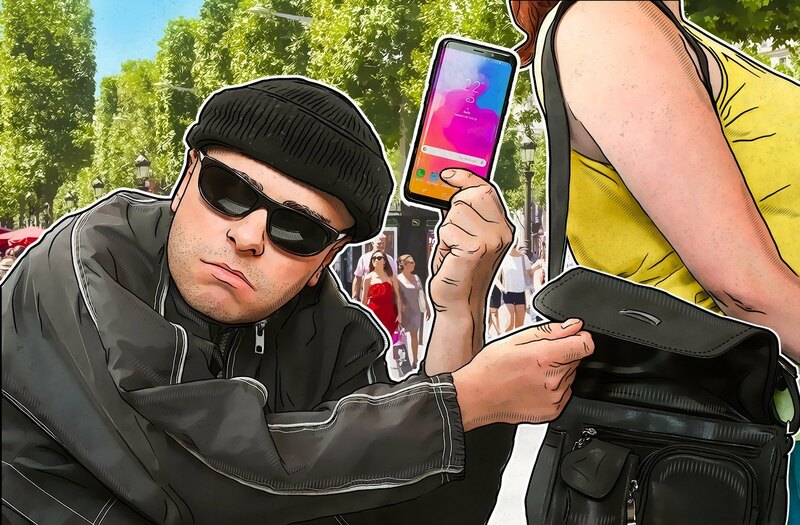 If everyone put passwords on their phones, pickpockets would be out of a job, because the market for stolen phones would simply vanish. To sum up: If you don’t want to help pickpockets, set a password on your phone. A simple 4-digit (or better, 6-digit) PIN will do, or even an entire password. If you find fingerprint or face authentication more convenient, try that instead (although we recommend you read up on these technologies first; see our posts about fingerprint reading and face unlock). And if you want to increase your chances of ever seeing your stolen device again, and make doubly sure that criminals don’t get hold of your precious data, think about using an anti-theft system. Modern mobile operating systems have some built-in. In iOS, the feature is called Find My iPhone; in Android, it’s Find your phone. These functions use geolocation data to help trace the missing device, and they can lock it or even wipe its memory if necessary. Covertly takes shots with the front-facing camera to help you identify the thief. Wipes personal and other data from the device. You can download Kaspersky Internet Security for Android here. The basic version is free and includes the Anti-Theft component.